What would you do if you walked up to a door and you saw a hand reaching out to you like this one? 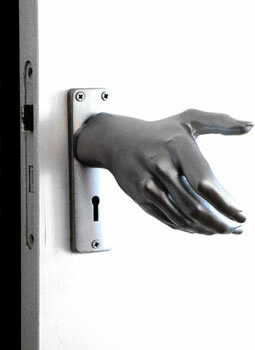 This door handle is something that would freak me out to even touch. If I had to touch this door handle, my first inclination would be to push the door with my crotch and get myself a good feel out of opening the door, except that the hand is a bit too thin and witch-like for my taste. The designer Naomi Thellier de Poncheville calls it "Hand-le" . I call it weird. I am not sure what the point of it is. I think if she fattened up the hands a bit to make it more appealing, perhaps made it out of a softer material than cold bronze and adjusted the angle of it to be more inviting... ooh, that's it baby! Now, you got something a man could get excited about. It does makes me think of all the other anatomically correct parts you could mold and use as a door handle that I would enjoy more than bony hands. Can you think of all the funny ways you could use something like this? Talk to me folks and make me laugh. Does Social Media's First President Need To Go Back To The Well In 2010? How about in a Psych Ward.